This makes quite a lot of botamochi/ohagi about 2 inches / 5 cm or so long. If this is too much, halve the ingredients. They also freeze very well - see Notes below. By 'cup' here I mean the measuring cup that comes with a rice cooker, which has a capacity of 180ml. As long as you keep the same proportions you can use larger (e.g. American size, which is about 220ml) cups too. The day before, wash the rice well, and wash and sort the azuki beans. Soak the azuki beans and the rice (separately) in enough water to cover, overnight or at least 8 hours. Drain well. Make the tsubuan following these directions. Cook the rice in a rice cooker in the normal way, with the indicated amount of water for 3 cups of regular rice. In the meantime, toast the sesame seeds in a small frying pan until the seeds begin to pop. Remove from the pan into another bowl and mix well with the sugar and salt. Mix together the kinako and the sugar and salt in another bowl. While the rice is still warm not not burning hot anymore, put it in a large ziplock plastic bag. Close the zip, pushing out as much air as possible. Pound the rice and squeeze it and knead it until it's sort of half-crushed (it's mostly paste but you can still see some rice grains in there). This state is called hantsuki, or half-beaten, mochi. Let cool a bit in the bag. Divide the mochi into 24 or so equal pieces. To make the kinako-coated dumpling: flatten a piece of mochi on a sheet of plastic wrap, trying to make the edges a bit thinner than the middle, with moistened fingers. Put a teaspoonful or so of tsubuan in the middle. Carefully gather up the mochi around the filling (just like you'd do with onigiri) to form a sort of oval-shaped ball, completely enclosing the tsubuan filling. (This oval shape is called tawara-gata, or rice bale shape.) Roll the dumpling well in the kinako-mix. You may need to roll it 2 or 3 times since the kinako tends to sink in to the rice. Make the sesame coated dumplings in the same way. To make the sesame stick better you may need to lightly moisten the surface of the dumpling. To make the tsubuan-coated dumplings, make a small oval-shaped ball with the mochi. Spread some tsubuan on a piece of plastic wrap, and gather up the plastic to make a ball. If the dumpling looks funny you can adjust it a bit after unwrapping it from the plastic wrap. Serve with green tea, preferably while gazing at some beautiful spring (or fall) scenery. In the photo at the top, I've presented the botamochi in a lacqured black wooden box. In the second picture the dumplings are on a black ceramic plate. Black seems to suit these better than white. These do not keep well in the refrigerator since the rice hardens up, so keep in a cool place until it's time to eat them. They can be frozen successfully though: just wrap them individually in plastic wrap, and defrost at room temperature or nuke in the microwave for about a minute per dumpling (depending on the wattage of your microwave). I find that adding a bit more salt to the tsubuan for this makes the dumplings tastier. Submitted by maki on 2008-09-23 11:31. 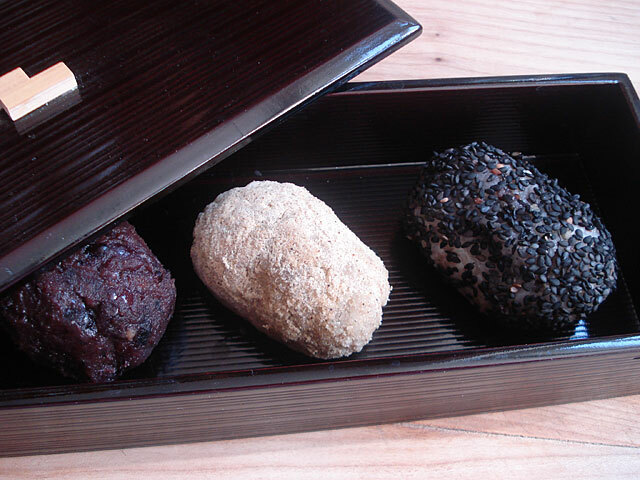 Ohagi is my mom's favorite from when she was little! Thank you for the recipe. I'm want to make her some next week as a special treat that will bring back fond memories. Botamochi / ohagi are real comfort food for my mother too. I like them a lot but I guess they are the comfort food of the previous generation. I hope your mom will like them! I have only just found this website and I think your blog is fantastic! I would love to cook this, and many of the other recipes here, but I am not sure about the ingredient avaliablility in Australia. Would you happen to know if I could find, for example the sweet rice, etc in Australia or where I could import it from? Where can I buy any japanese cakes with azuki in them? 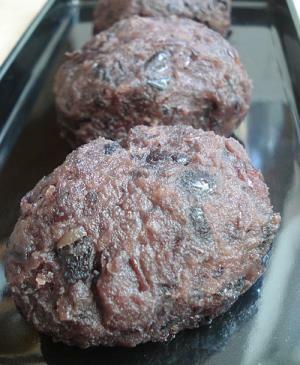 I am looking for any japanese cakes with azuki beans (ie. daifuku, an donuts, anpan, yokan etc.) I am based in Brisbane, Australia and would like to know if I can't buy them here, can I order them from Japan directly? 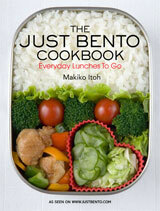 The best place to ask would be your local Japanese grocery store, if there is one. Since all the items you mention are freshly made items (except for yokan) they can't be shipped long distances (unless they are frozen). What a interesting and informative website you have got. By the way, would you know how to make Shiodaifuku? However Japanese ingredients are not readily available at where I live. Do you know if I can substitute mochimai for glutinous rice (the type used for Thai rice dessert)? Not to deviate from the subject, but I have been interested in making straight mochi without mochiko. I have read about an usu and the mallet used to pound the rice, but I have not seen information of what they are made of. Obviously some kind of hardwood, but is there a preference? Is there a particular way they are made? As well, have you had experience making mochi in a breadmaker? I have had no success. And thank you for a wonderful website! The usu and mallet are both made out of wood. They are like a giant mortar and pestle. The usu (the 'bucket' part) is originally made out of a hollowed out wood trunk I think, or stone. I don't know what kind of wood is used but I think it is hinoki (Japanese cedar). Pounding mochi is a two-person job - one strong person pounds with the mallet, while another rapidly turns the rice ball over, avoiding getting their hands crushed! Here's a video on YouTube showing how it's done. My aunt and uncle used to do it every New Year's...they weren't that fast but they were still a great team! Commercially though, mochi is made in a machine that does resemble a bread baking machine, but with a stronger motor. (My mother used to have one of these, and we did make mochi with it when we lived in the US, just for New Year's). I've never tried making mochi in a bread baker since I don't own one. I have tried making it in a food processor, and that sort of works - if you just do small amounts of rice at a time though, and your processor better have a good strong motor! These both look like great projects to do with kids. Is there a recipe to make mochi using glutonious rice flour. I bought some at my local asian supermarket but can not find a recipe I trust. Also I would like to make mochi AND mochiko. I have a can of anko past that I bought. hi there:)..i want to clarify something..is it botamochi is one of the type of wagashi? I am living in Japan at the moment, and I made these to take to hanami with some Japanese friends. They were sooo impressed - as not many people actually hand make these anymore. My tsubuan was not very sweet at all, but it seemed to be rather popular!! Thank you so much for the recipe - it may be easier to buy these, but it was lots of fun to make, and definitely worth the effort! omg this sounds sooo fun!!! why did i not discover this sooner?? how long do you think it'll take in a rice cooker?